The relative position and direction of brain structures are described with special words. For example, we can say that the frontal lobe is "rostral" to the occipital lobe. Because the brain is a three dimensional structure, any location in the brain can be localized on three planes - the x, y and z planes. The brain is can be cut on any of these planes and are named the coronal plane, the horizontal plane or the sagittal plane. The coronal plane, horizontal plane and sagittal plane are shown in the figure on the right. The coronal plane is also called the frontal plane. Slices of the brain taken in the coronal plane are similar to the slices from a loaf of bread. Horizontal cuts are made as if you were slicing a hamburger bun or bagel. The sagittal plane divides the right and left side of the brain into parts. The midsagittal plane would divide the right and left sides of the brain into two equal parts, like cutting down the middle of a baked potato before you put on the toppings. 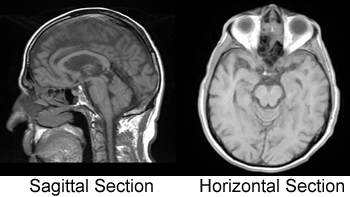 You can find photographs of coronal sections from the human brain at the Comparative Mammalian Brain Collection.